Here is a little sneak preview of ProBEC /Aprovecho’s work in Lesotho in the last month (September 2003) Expect CAD drawings, more photos and non-anecdotal test results in the next week. 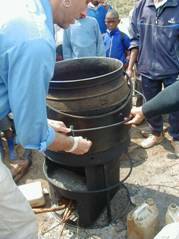 The Nkokonono (which means "Big Man in Sesotho") is the latest incarnation of the Winiarski Rocket Stove! 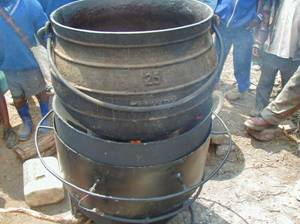 One of our goals for this consultancy in Southern Africa is to design a catering/institutional stove that is cost effective, portable and can accommodate the local pots. This doesn't sound like much of a challenge except for the fact that the local pots (shown below) weigh approximately 71 kilos apiece and have three irregular legs that allow the pot to stand 10 cm off the ground. 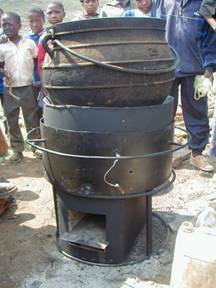 We began with our basic design from our institutional stove that we designed in Central Africa (see last weeks Uganda report at www.repp.org). We have managed to whittle that design down to the stove you see below. The new stove is considerably lower (about half the height) half the weight and a third of the price (800 Rands or US$110). 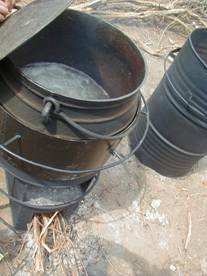 It has a cone that maintains the cross sectional area around the bottom of the curved pot, and has three boots which allow the pot to sink down below the combustion chamber. The bottom of the pot is now only 4 cm above the combustion chamber. and then the stove skirt is raised up to the handles of the pot. Note: the skirt could actually be raised another 5 cm higher, which we will do in the next test. Here is the 15 litres of water boiling vigorously after 18 min (with pot lid on) of heating. This was not a scientific test. We didn't measure the temp of the water nor weigh the amount of wood before hand so take this number with a grain of salt. Ill send proper test results soon . Note: the rolling boil and no visible smoke all with a few twigs! Also Note the very tight gap between the skirt and the pot: about 7mm. In the background you can see another Nkokonono made from a normal 220 Litre drum. The drum creates a perfect skirt for the #20 pot (about a 1 cm gap between pot and skirt). The one problem is that this stove is taller than the Nkokonono #25. We built a 3-sided platform around this stove but we are expecting that it will still be somewhat awkward for the woman to get the pot into the stove. 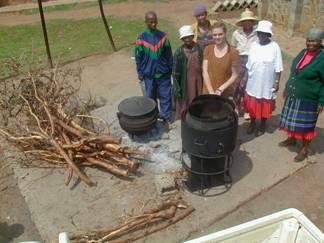 But its simple stove to build so we thought we would try it. Here's the amount (lower left) of wood that we used to boil 25 litres! 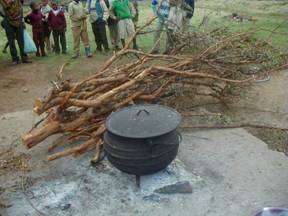 We are now organizing a pilot project with WFP (and others) to place 50 stoves in schools around Lesotho .